Finally, Google Street View does something good. A car thief suspect was caught using Google’s Street View service which has created some buzz in the tech gossip circles. An RV owner who was not named was shocked to find his 4×4 stolen that was parked on his private property. Fate has it that a Googlemobile was passing by his residence shortly before the theft took place and snapped pictures of a large bald man with glasses standing beside the car moments before it went missing. 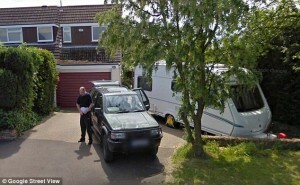 The incident occured in the UK and the owner contacted the Derbyshire police after checking Google Maps of his area. The police then released the image to the public in order track down the criminal. Police Constable Adrian Mason said, “It is amazing that we have such a clear image of a man who we think will be able to give us information. It was an amazing coincidence that the Google car was passing at that time”. Weird – Google now has Street View service for Antarctica! Next Google Offers Engineer $3.5 Million to Not Join Facebook!